Foods containing plant sterols can significantly reduce cholesterol either by themselves or in conjunction with statin drugs such as Lipitor and Zocor. The National Cholesterol Education Program has released recommendations that people eat more of these foods in order to reduce cholesterol and their risk for certain types of heart disease. Most people do not naturally get enough plant sterols in their diet, so drug manufacturers have come up with a pill to do the job. Plant sterols need fat in order to work, since they are not water soluble, so the most common source is margarine products. It would take more margarine (about 2 tablespoons daily) than most people eat to get enough benefit. Plant sterols reduce cholesterol by affecting the absorption of cholesterol by the body. As cholesterol is transported about, the plant sterols get in the way and the cholesterol cannot be absorbed. This works because the plant sterols are similar to cholesterol in their structure. 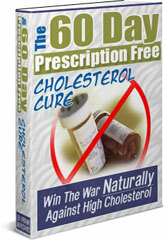 The pill form of plant sterols used to reduce cholesterol combines the sterols with lecithin. Lecithin allows the sterols to be dissolved in water so the intestine can absorb them. In a study at the Washington School of Medicine in St. Louis, 26 patients on statin drugs were observed after one-half were give the plant sterol pill and the other half a placebo. Within 6 weeks, those on the pill reduced their LDL (bad) cholesterol by 9% and total cholesterol by 6%. Study directors agree that the pill must be used in conjunction with a low cholesterol diet and exercise. Adding lecithin alone can also significantly reduce cholesterol. To learn more about how to get lecithin into your diet and reduce cholesterol naturally, get The 60-Day Prescription Free Cholesterol Cure. Copyright Notice - The above article is the copyrighted property of 60DaysToLowerCholesterol.com. This article may not be reproduced on another website, book, or publication without express written permission from Frank Mangano. Any reproduction of this article without the explicit written permission of Frank Mangano and 60DaysToLowerCholesterol.com is strictly prohibited. Dietary Cholesterol -- How Much is Okay if You Need to Reduce Cholesterol?